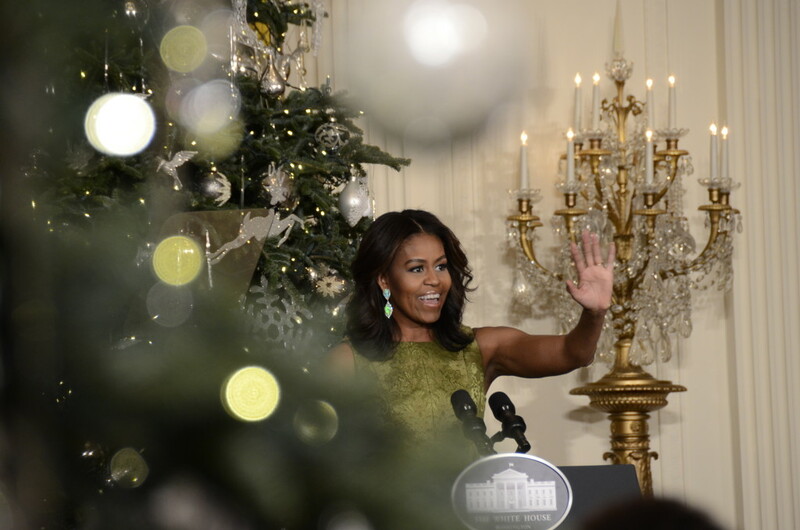 First lady Michelle Obama welcomes military families as the first to see the White House holiday decorations. The East Room features four trees decked out in ornaments of white, silver and champagne. SHFWire photo by Rebecca Anzel. 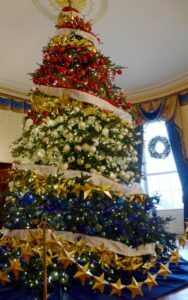 WASHINGTON – This year’s White House holiday theme, “A Timeless Tradition,” celebrates the customs and events that shaped the U.S. over the past two decades. There are messages from schoolchildren sharing their ambitions on snowflakes hanging from the ceiling in the East Colonnade and a forest of novels celebrating American authors in the library. These “decorations celebrate proud American traditions and our singular American spirit,” first lady Michelle Obama said Wednesday at a press preview of the decorations. Other rooms honor military families as part of Obama and Jill Biden’s Joining Forces initiative. The East Visitor Entrance houses a tree decorated with gold star ornaments honoring the families who have a relative in the Armed Forces who died in the line of duty. Surrounding the tree are iPads meant for guests to send digital holiday messages to troops currently serving. The official White House Christmas tree, an 18-foot Fraser fir, is decorated in red, white and blue and wrapped with a gold star garland to honor the sacrifices of American service members. The tree in the Blue Room was grown by Jay and Glenn Bustard in Lansdale, Pa. SHFWire photo by Rebecca Anzel. The 18.5 foot tall White House Christmas tree is dedicated to service members as well. Decorated in red, white and blue, the Fraser fir has a ribbon winding around it with messages from military families to their service members. At the end of the season, Obama said the families will receive their section of the ribbon as a keepsake. “We want to make sure that we’re serving all of you – all of our men and women in uniform, our veterans and our military families – as well as you serve us,” Obama said. “And as we ring in another holiday season, we’re going to make sure that the over 68,000 visitors who will pass through these rooms over the coming weeks know about and honor your service and sacrifice. Eighty-nine volunteers decorated the White House with over 70,000 ornaments, 62 trees and 56 snow-people. Most of the designs reused decorations and other materials from previous years – only 10 percent of the ornaments and embellishments are new. This year’s gingerbread house weighs nearly 500 pounds, including 250 pounds of gingerbread dough, 150 pounds of dark chocolate and 25 pounds of icing. After her remarks welcoming military families to the White House, Obama invited the children into the State Dining Room to make crafts and snacks. First dogs Sunny and Bo made an appearance as well. With the stress of the holiday season, Obama said some people forget this time of year is about giving back. She invited military families to see the White House decorations first because they serve their communities every day.